Review: This book was a HUGE disappointment. I love, love, LOVE the first in this series. I thought it was original, and I love how it focuses more on the plot than the romance. This book didn't do that. If I had to read ONE MORE TIME about someone cleaning/tickling/exploring another person's TONSILS I was going to die. This book was definitely ROMANCE with a little paranormal. Which made me very sad. Granted, it was still an interesting story, despite the fact that there was some serious sequel-bloat. It took FOREVER for anything interesting to happen, and then it wrapped up super-quick. All in all, I love the first book so much that I'll definitely read (and purchase) the third. 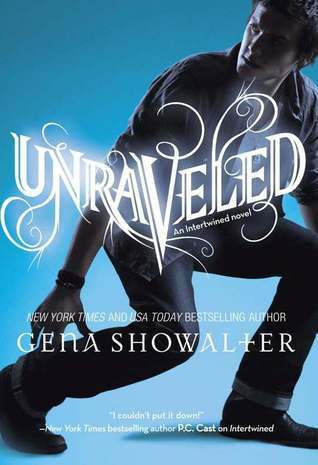 I hope it goes back to the style of the first, because Unraveled was almost just like every other paranormal book that's out currently. Not bad, but nothing special. I can't get myself to read sequels these day b/c the 1st ones are always better! lol I'd loved the 1st book so hopefully...maybe this one I can fly through it lol :) Great Review.